Buy Total Sweet Xylitol - 225g in the UK from our online shop or directly from our independent Scottish store. Xylitol, also called 'wood' or 'birch sugar', has been known about and used as a sugar alternative for many years. This sugar alternative can be used in baking, tea or coffee. Xylitol sugar alternative can be replace sugar 1 for 1 in all baking and recipes. It's lower in calories and has a lower GI than ordinary table sugar. You can use all sorts of berries for this recipe, like strawberries, red or black currants, brambles or blackberries, blueberies, honeyberries. You can also use frozen berries. This recipe contains 2 tbsp Xylitol Sweetener. We sell real Total Sweet and other Sugar & Sweeteners directly from our shop in Scotland and online throughout the UK. 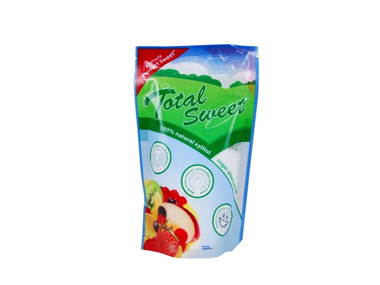 View more products from Total Sweet. Where can you buy real Xylitol - 225g safely online? If you are wondering where you can buy Total Sweet Xylitol - 225g safely online in the UK, then shop with us. We are an actual health foods shop; with real people selling real foods and products. Our award-winning independent shop is located in Stirling, Scotland since 1976. You can buy our Sugar & Sweeteners in store or safely place an order with us online or over the phone. Xylitol - 225g - Total Sweet Xylitol - 225g in Sugar & Sweeteners and Foods.